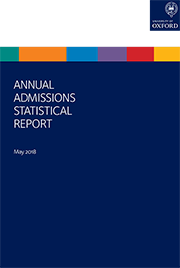 Oxford University is pleased to publish its Annual Admissions Statistical Report. This gives information on the students who have applied to our undergraduate courses, received offers and been admitted, over the last five years. The statistics are broken down by domicile, nation and region of the UK, disadvantage, school type, gender, ethnicity and disability, and they are presented at University level and by course and college. There is a lot of good news in the report, as well as evidence that there is still a great deal of work for us to do. A number of groups remain under-represented in our community. We are determined to make further progress through our outreach work, and through our partnerships with schools and other organisations. We are delighted to announce a significant expansion of our largest and most successful programme, the UNIQ summer school. If you’re a student thinking about Oxford, or a teacher or a parent, we would love to hear your ideas about our outreach work. If you would like any more information about Oxford please contact us, or come along to one of our events. Contact us: news.office@admin.ox.ac.uk, +44 (0)1865 280528.